China has long had plans for laying 120,000 km worth of railways by 2020, but as the global economic slowdown begins to bite, it looks as though the money will be spent faster than planned to help speed flagging economic growth in China. In September and October, the Ministry of Railways announced eight new railway projects in various parts of the country. Their investment has added up to 405 billion yuan, equaling 78 percent of the total investment that China poured into railway construction from 2003 to 2007. In the past five years, the total investment for the railway infrastructure was 522 billion yuan, Minister Liu Zhijun told a working conference in January. The start-up of the eight railway projects in a short period of time is the beginning of a railway construction boom. The ministry's planning department chief Yang Zhongmin says about 3.5 trillion yuan will be invested on railway projects in next three years. At present, 150 railway projects are under construction, involving an investment of 1.6 trillion yuan, he says. Converting the figures (at 6.8 yuan to the dollar) we get: $60 billion in new rail projects announced in Sept/Oct, $77 billion spent on rail in the last 5 years, $515 billion to be invested in the next three years, and 150 rail projects under construction worth $235 billion. Damn! That's my kind of bailout. It makes you wonder why the US can't do something like that. Assuming that they wanted to, are the Americans even capable of rolling out a large rail project? I'm thinking: probably not. It's clear that China is paying attention, and making the moves they need to make to thrive in the 21st century. Meanwhile, the US is blogging up a storm on all the doom sites. It seems that much of the angst about TEOTWAWKI (The End Of The World As We Know It), is really more about TEOAAWKI (The End Of America As We Know It). The Export Land Model (ELM) is a concept widely promoted by Jeffrey Brown of the Oil Drum. It describes how rising consumption by oil producing nations, combined with peak production in those nations, accelerates the decline in net exports. I won't rehash the basics here, so if you need to get up to speed, please see Brown's article here or Wikipedia etc. To begin, let me be clear that the ELM is a genuine effect which merits serious attention. On the other hand, Mr. Brown has a well-documented history of bluster and exaggeration, so this post will be the first in a series of posts which audit the ELM. The purpose will be to separate the facts from the hype. 1. The danger of the ELM is that it accelerates the decline in net exports. How large is that accelerating effect? Not that large. In the illustrative case shown in Fig. 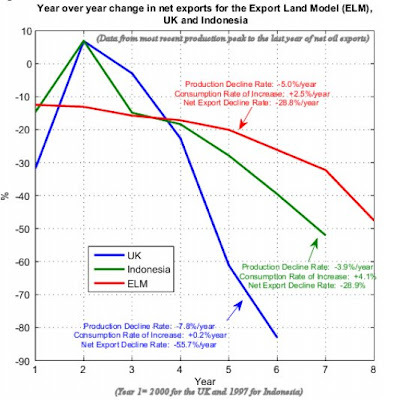 1 and Table 1, the ELM causes net exports to drop to zero in 9 years. If we eliminate the ELM by stabilizing consumption at 1mbd, net exports drop to zero in 13 years. The accelerating effect of consumption is quite moderate. 2. In his remarks on the model in Fig. 1, Brown writes: "the net export decline rate in a given year accelerates with time, from an initial year over year change in net exports of -12.5% to a final year over year change in net exports of -47.6% (last year of net exports)"Source. This is technically true (despite the error in Brown's math). However, it is extremely misleading and an abuse of statistics. Yes, the year-on-year decline rate rapidly increases, as shown by the far right column of Table 1, which indicates the year-on-year % decline in the "Net Exports" column. Note, however, the column labeled "Decrement" in Table 1. This shows the actual amount of exports lost in each year due to the ELM effect. As you can see, the lost amounts actually *decrease* in size as the years go by. Far from being a decline at an "accelerating rate", the decline is actually less steep than an ordinary linear decline (where a fixed amount is lost each year). Brown is basically making a mountain out of a molehill. Any linear decline can be painted as an "accelerating decline rate" using Brown's gimmick. Suppose, for example, you have a gas tank filled with 10 gallons, and you use one gallon per hour. Then the hour-on-hour decline rates are: 1/10, 1/9, 1/8, 1/7, 1/6, 1/5, 1/4, 1/3, 1/2, 1 (= 10%, 11%, 13%,14%, 17%, 20%, 25%, 33%, 50%, 100%). Voila: an ordinary linear decline can now be fraudulently painted as "decline at an accelerating decline rate". Fig. 2: The horror of "accelerating decline rates"
As noted above, the same sort of diagram can be produced for an ordinary fuel tank running down at the mundane linear rate of 1 gallon/hour. In the last two hours the decline rates are a horrifying 50% and 100%, respectively, and the "exponential decline rate" for the entire 9 hour draw-down is a hair-raising 22% per hour! The bottom line is that all this talk/graphing of "accelerating decline rates" is misleading nonsense. As I've shown, the ELM results in a net export decline which is sub-linear (i.e. less steep than a linear decline). Brown himself acknowledges this in Fig. 2 where he gives a consumption increase rate for the UK of +0.2%/year!! 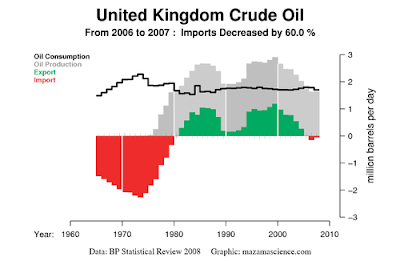 Clearly the UK does not follow the ELM, and it's rapid decline to zero exports over 6 years was not due to the ELM. So why did Brown choose the UK to illustrate the horrors of the ELM? Personally, I would call it a lack of integrity. Brown is always looking to goose the doom level with scary advocacy numbers, so he cherry picked the UK as an example -- undoubtedly because it's a country with an alarming decline rate, and he hoped to fraudulently associate that rate with the ELM model. Even assuming that Russian production declines at a rate of 5% per year (which is highly unlikely considering the country's size and diversity, see 317. 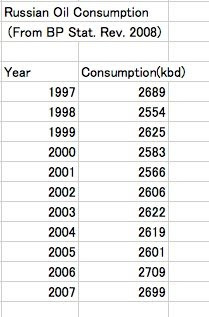 STRONG ARGUMENT FOR A SLOW DECLINE and Hubbert Theory Says Peak Oil is a Slow Squeeze), consumption would need to rise at 10-18% per year for exports to decline to zero in 6-9 years, which is completely preposterous given Russia's recent consumption growth. Using more realistic figures for Russian production decline (-3% per year) and consumption increase (+1%, which is probably on the high side given Russia's rapidly declining population), Russian consumption doesn't exceed production until the year 2039. 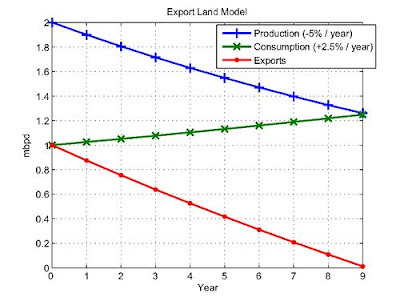 As you can see from the above, a clear of understanding of the Export Land effect is going to involve a comprehensive analysis of the complete export situation worldwide -- not gimmicky analysis of cherry-picked examples. I will describe my results on that front in Part 2.